"Selfie" is a word that has only found itself more deeply embedded in our pop culture vernacular in 2014. Certainly electronic dance music duo the Chainsmokers have played a role in this with their hit song simply titled "Selfie." Ellen DeGeneres's Oscar selfie, which has been retweeted more than 3 million times, helped the cause as well. But now iStrategyLabs is putting a new twist on the word with its latest invention. 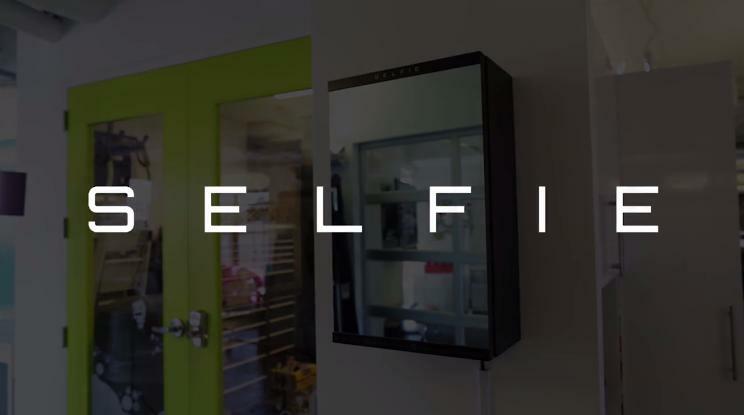 "S.E.L.F.I.E.," the company says, is an acronym that stands for "Self Enhancing Live Feed Image Engine." Still a work in progress, the product is a two-way mirror that snaps a photo of you. "Triggered by simply standing in front of the mirror and holding a smile, hidden LED's indicate a countdown, then simulate a 'flash' as your photo is taken," iStrategyLabs' Margot Mausner wrote on the developer's blog. "The photo is then automatically posted to Twitter (with a watermark/logo)." A webcam and Mac mini sit behind the two-way mirror and serve to power the camera and facial recognition software. In the demo video on Vimeo, the S.E.L.F.I.E. looks about as big as a mirror that you would find above a bathroom sink. For the selfie enthusiast, there are obvious pros to the invention — the length of your arm or the angle at which it can hold a camera no longer limits your self-taken photograph. Also, the S.E.L.F.I.E. produces a nonreversed image, as opposed to the mirrored images taken by front-facing cameras on smartphones. The Self Enhancing Live Feed Image Engine is not available for sale yet, but on iStrategyLabs' website, the company invites people who are interested in purchasing one to reach out to it online.